This website/blog is dedicated to Our Lady of Guadalupe. Support the film – Unplanned. I miss him! I really miss Pope John Paul II! Even though he was my Holy Father, I mean really mine, since I am the JP2 Generation; I always felt that he was more than just my Pope, it felt like he was my grandfather. Pope John Paul II had a charisma about him that is hard to put into words for the younger generation that just knows about him. 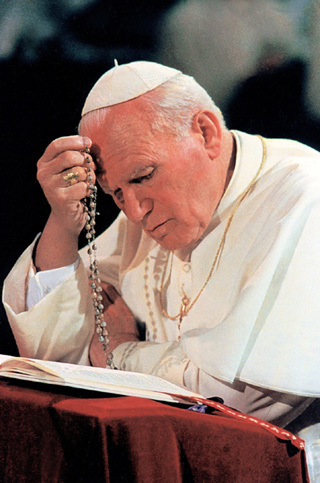 For those of you my age, who grew in faith during in his pontificate, we know Karol Wojtyla, we know Pope John Paul II. Although I never met him face-to-face like others I personally know, I still feel a real connection with him. It’s the same connection/feeling I have when I sit in the presence of the Blessed Sacrament. As I sit at my workspace, surrounded by many books on a long dining room table and listening to the track, Cristo E Liberazione and others – https://tomperna.files.wordpress.com/2013/10/02-cristo-e-liberazione.m4a from his CD, Abba Pater, tears are dripping from eyes and rolling down my cheeks. As I glance to the left of my computer screen, I see a pile of papal documents all written by his pen. His many words sit only a few feet away from me. Recently, I told a group of adults at a talk I gave that the reason I do what I do with my theology education is because of John Paul II. Hearing his voice is calming and refreshing. It’s the voice of a saint; it’s the voice of my Pope, my “grandfather” – Blessed John Paul II. Make sure you take a few minutes and listen to it. Today is the optional feast day and the last one we will celebrate before he is officially canonized a Saint of the Universal Church. On September 30, 2013, Pope Francis announced that Blessed John Paul II, along with Blessed Pope John XXIII, would be elevated to Sainthood. I still can’t believe that John Paul II will be a canonized saint. I am filled with such joy, and yet bewildered. It’s going to be a great day in the life of the 21st century Catholic Church! More than likely, I will watch the Canonization Mass from my living room as I did with friends for his Beatification Mass. Yes – I threw a Beatification Party for him. If I am blessed enough to be in Rome, I will have an arsenal of blog posts to share with you. 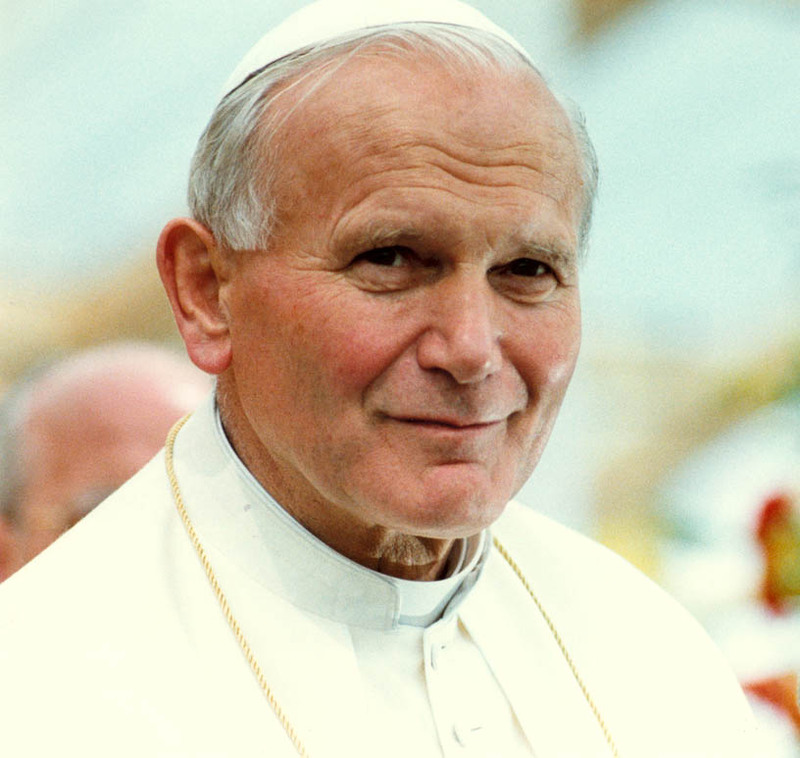 For me, when I am faced with a difficult decision or things are rather hard in my life, I remember the words of Jesus Christ, the words often on the lips of Blessed John Paul II – “BE NOT AFRAID!” These are the words he repeated through his pontificate, these are the words we must hold firm to as we continue to evangelize the Culture of Death and make known the Culture of Life. Like John Paul II, we are On a Mission From God! Are you ready for the Pope of the New Evangelization to be counted among the Saints of Heaven? Are you ready for the Pope of the Human Person to intercede for your prayers before the Heavenly throne of Jesus Christ? Are you ready for Saint Pope John Paul the Great? April 27, 2014 (Divine Mercy Sunday) will be here before you know it! Go here for more on Blessed John Paul II. I hope you can read and share these blog posts with your family and friends. Blessed Pope John Paul II…Pray For Us! This blog post is dedicated to Christine Accurso and everyone at 1st Way Pregnancy Center of Maricopa County. There is a lot of connections with Blessed John Paul II and the new building. The work they do and will continue to do will serve many women and men. I share with you the joy of being part of the JP2 generation. Being in college,in 1978, beginning to take faith seriously for the first time, I was excited when John Paul became Pope. I had no idea then how profoundly he would affect my life over the next couple of decades. What an extraordinary blessing he was to the Church and the world!